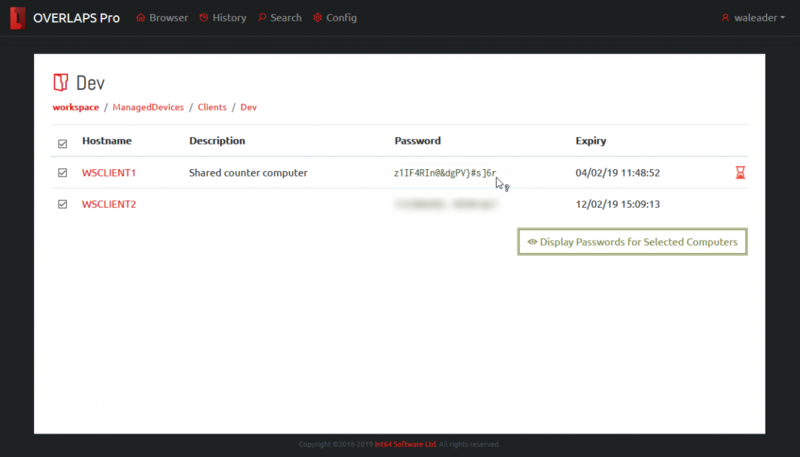 In our last article we showed how carry out a fresh install and configuration Microsoft’s Local Administrator Password Solution (LAPS) in your Active Directory environment. If you haven’t read that already, start by following this link. 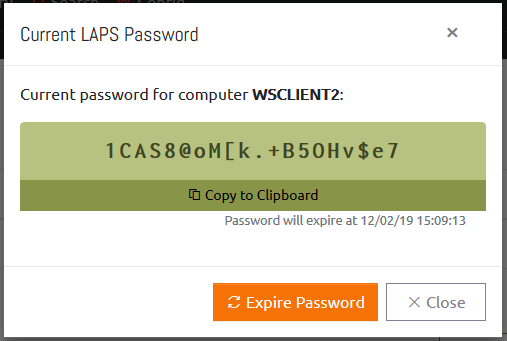 LAPS is an incredibly useful free tool provided by Microsoft to automatically manage the Local Administrator account password for your domain joined Windows computers, and is a security tool that any organisation with an Active Directory domain should have. However, the client user interface it provides leave a lot to be desired as it only works on Windows computers and is very simple in design. So today we’re going to take that one step further by installing and configuring OVERLAPS. 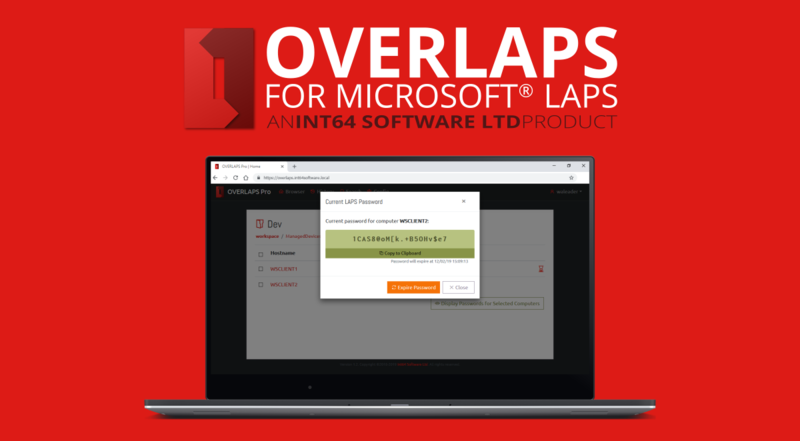 OVERLAPS is a third party add-on for LAPS which provides a web interface, so you can now access LAPS managed passwords from any device, including mobile phones, while on the move. 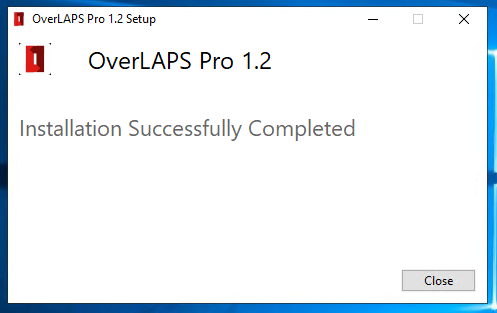 We’re going to be installing OverLAPS on a Windows Server 2016 box with nothing else on it, but it can be installed on any Windows device after Server 2012 R2 or Windows 10. OverLAPS a really light-weight application, so we’ve just setup a single core, 512Mb RAM virtual machine in Hyper-V for this demonstration, and it really doesn’t need more than that. In the real world, we’d probably recommend installing it on an existing host so you’re not paying for another Window licence. The only gotcha to watch out for is if another internet service is already using ports 80 or 443, but we’ll cover that later. Double click the OverLAPS bundle installer to start the installation process. 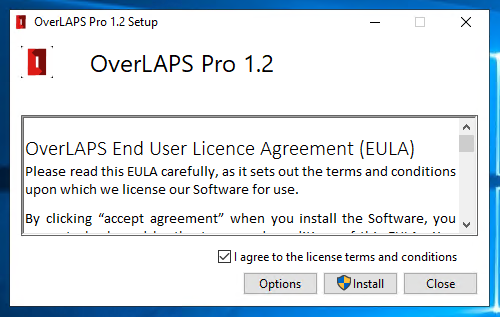 The End User Licence Agreement will display, which you should read even though nobody ever does. There aren’t any surprises in there though, so once you’re happy check the “I agree…” button and click Install. Once the installation process has completed, you’ll be shown a success message. If everything went to plan, you should now see the OverLAPS service installed and running. You can check this by running the Services system tool (Start -> Run -> services.msc). If you notice the service isn’t running, check the log file in “C:\ProgramData\Int64 Software Ltd\OverLAPS” for problems. The most common cause for failure is because another process is already serving HTTP content on port 80. By default, the OverLAPS is configured to use port 80 for unencrypted (HTTP) traffic and port 443 for encrypted (HTTPS) traffic. Note that HTTPS is not enabled by default as you first need to install a certificate, but more on that later. The ports can be changed to any valid port number (1–65535), but remember to check a list of known ports (such as this handy one on Wikipedia, or this list of default ports used by Windows) to make sure you don’t conflict with anything. Any changes to the configuration file require the OverLAPS service to be restarted. You can do this by right clicking the service and selecting Restart (or just Start if the service is already stopped). By default, the OverLAPS web server will use the NT LAN Manager (NTLM) to handle Integrated Authentication requests (as opposed to the form login method). While this is fine for most cases, NTLM has been shown to be vulnerable to certain Man-In-The-Middle attacks, so it is recommended that you configure it to use Kerberos instead. In order to do this, some additional configuration of your domain is required. Specifically you need to define a Service Principal Name (SPN) for the server you’ve installed OverLAPS on. You can do this with the setspn.exe command line tool. Where “<servername>” is the name of the server OverLAPS is installed on how a user would connect to it, and “<machineaccount>$” is the system account name of that device. For more information on configuring Service Principal Names, please refer to Microsoft’s documentation on the subject. To further increase security to OverLAPS, we recommend that you install an SSL certificate so that your client <-> server traffic is encrypted. You’ll need to purchase or generate a certificate for this purpose, which is beyond the scope of this guide (but there are plenty around explaining how). But once you have your certificate file (.pfx or .p12), install it to the Personal folder of the Current Computer certificate store). 14. Follow the rest of the dialog to complete the import. 16. Navigate to the Details tab, and scroll down to “Thumbprint”, copy this value for use in the next step. To link your certificate to OverLAPS you need to use the “netsh” command from the command prompt. Where “<servername>” is the fully qualified name of your OverLAPS server as a client would access it (e.g. overlaps.contoso.com), and “<thumbprint of your certificate>” is the value you copied at step 16 of the last section. Be careful to make sure you copy the “appid” exactly as this identifies the OverLAPS executable is what you want to attach the certificate to. Once that is complete, you can now enable HTTP in the OverLAPS configuration file. Remembering to restart the OverLAPS service to register the change. After testing that this has worked, it is recommended that you then disable unencrypted HTTP traffic, which can also be done through the configuration file. Before you can login for the first time, you must first add yourself as an Administrator user. OverLAPS includes a command line tool for adding the initial administrators called “lapsuser.exe”, all subsequent users and groups can be added from within OverLAPS itself. If everything works then you should receive a success message. Users are stored in a configuration file, so adding users from the command line requires the OverLAPS service be restarted for the change to register. Adding or modifying users within OverLAPS does not require this step. You must have Administrator rights on the server to modify this file and any changes require the OverLAPS service to be restarted. If “true”, enables the respective type of traffic (unencrypted HTTP or encrypted HTTPS). The port that will be opened for HTTP or HTTPS traffic respectively (default 80 and 443). The maximum number of concurrent requests that the web host can handle. If you have a large user base and start noticing the website becoming sluggish, then you may wish to increase this value. If set to “true”, the user login page will be disabled and OverLAPS will only accept Windows Integrated Authentication logins. The maximum number of days that historical logs are kept. The path where historical records are stored. Provided in case the system drive has limited disk space. Allows you to apply simple branding to OverLAPS. For example, if this value was set to “@MyCompany”, the title on the OverLAPS web page would read “OverLAPS@MyCompany”. Specifies how frequently the Active Directory organizational unit structure cache is refreshed. Defaults to 21600 seconds (6 hours). If your AD structure changes frequently then you may want to reduce this. The main menu provides access to all of OVERLAPS main areas. The Active Directory Browser window allows you to quickly navigate your Active Directory structure for a particular Organizational Unit. Click a container to select it, then click again to open to that page. When a valid container with computers is selected, you will see the computers in a list. From here you can click on a computer to display its LAPS managed Local Administrator password. From this window you can click the “Copy to Clipboard” button to have the password copied to your system clipboard. You can also click “Expire Password” to trigger a password reset on the computer. Note that this will happen when the computer next performs a Group Policy update. Clicking the “Display Passwords for Selected Computers” button will retrieve the current password information for all of the selected computers. When retrieved, passwords are blurred for security reasons and can be displayed by hovering over the password or toggled between blurred and displayed by clicking. This symbol indicates that the LAPS password has expired and is due to be refreshed by the system. If this remains in this state for a long time, it may indicate that the computer is not processing its LAPS policy correctly. This alert indicates that the computer does not have any LAPS password data in Active Directory. If your LAPS installation is new, or the computer has only recently been added then this may be normal. 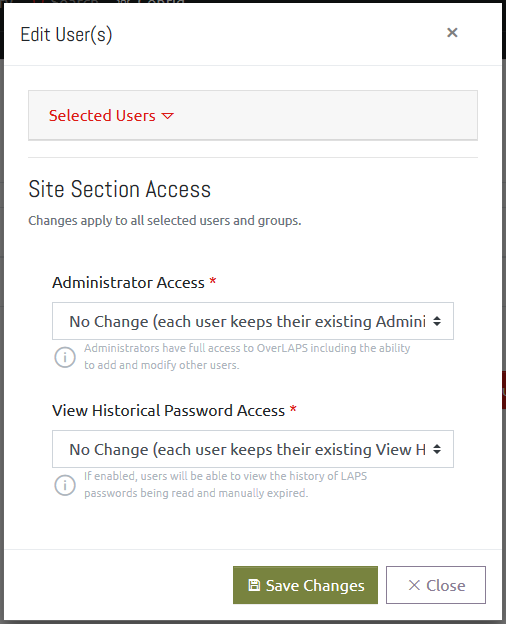 Navigating to the History section allows you to view historical data from users viewing computer local administrator passwords. Entries will either be listed as “READ” (a computer’s password has been viewed), or “RESET” (a computer’s password has been expired). Clicking the “History for yy-mm-dd” button allows you to change to an alternate day. Clicking the Search menu item will present you with a dialog to find computers by their hostname. Search results are grouped by Active Directory container, and functions just like a normal computer list. Clicking your search term at the top of the results allows you to refine your search or to include the computer’s description in the search. 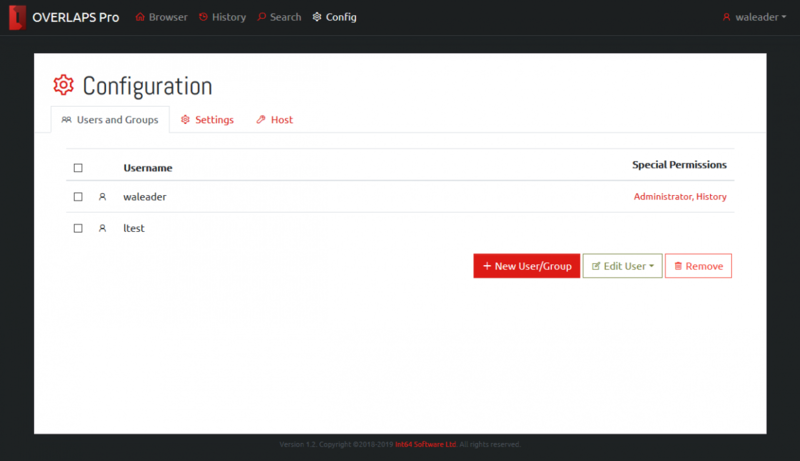 Users are managed through the Config section’s Users and Groups page available to administrators. To add a user, click the “New User/Group”, a window will appear allowing you to enter the user or group’s account (user) name. 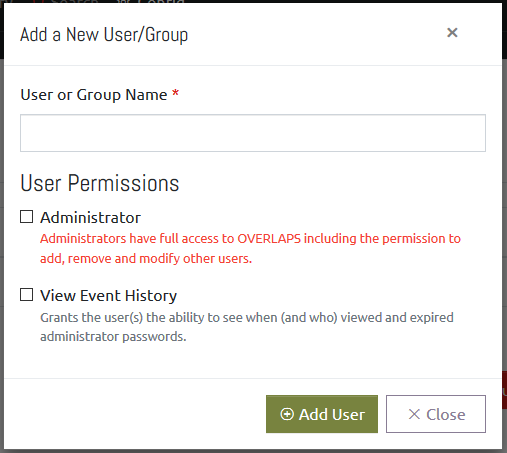 Here you may also select whether the user should be granted Administrator privileges and whether they should be able to view the event history or not. Select one or more users or groups by checking their entry in the user list, the click the Edit User button to see the options available. 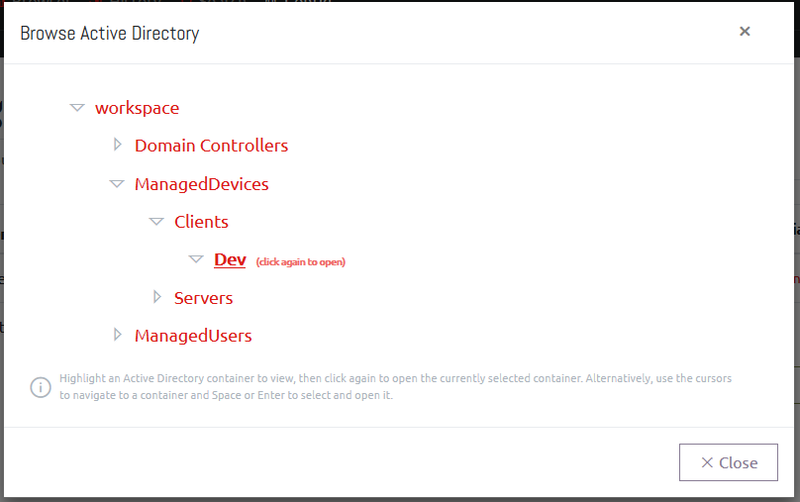 Use this window to select which Active Directory containers the users will have access to browse, search, and view and reset Local Administrator passwords in. To allow access to a container, simple expand the tree to that container and check its box. Checking a sub-container will automatically check all of its preceding (parent) containers and all of its child containers. To check the list of users you are currently editing, expand the “Selected Users” box by clicking on it. Clicking a user will deselect them, and any changes made when clicking “Save Changes” will not apply to them. Clicking the user again will re-select them. This window allows you to change the overall access that the user(s) have to the OverLAPS website. 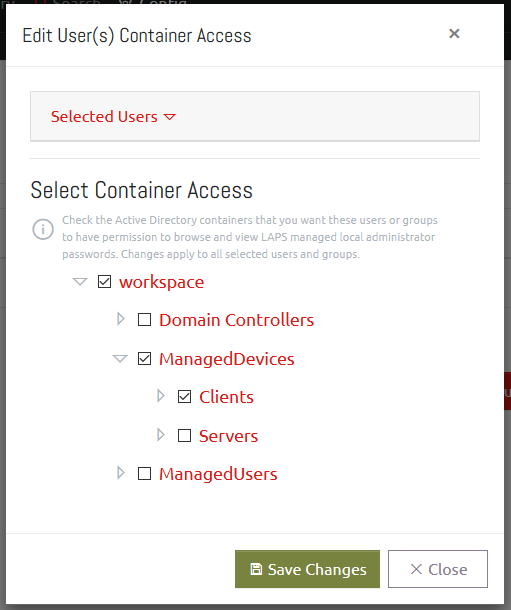 Administrators have full access to every Active Directory container, and the ability to modify users and site settings. This should be limited to only a few trusted users. People with “View Historical Password Access” permission have the ability to view a history of when Local Administrator passwords were read and reset. Setting an option to “No Change” means that no changes to each users’ current access will be made. Setting it to “Remove” disables the selected access for all selected users, and “Enable” will grant the selected access. 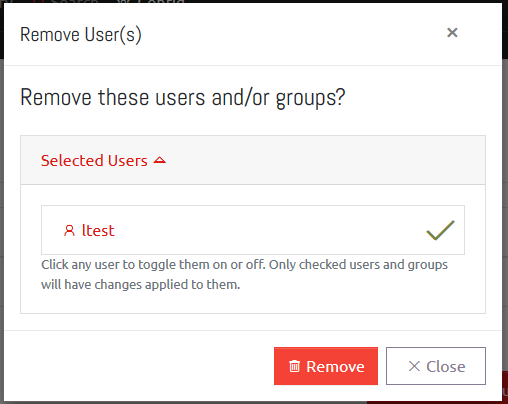 Selecting one or more users and clicking the “Remove” button will prompt you to confirm that you want to remove the user completely from OverLAPS. The settings section provide access to basic OverLAPS configuration options. Checking the “Enforce Windows Integrated Authentication” box removes the option for logging in via the form. Instead, users are logged in using NTLM or Kerberos instead, meaning that user passwords are not transmitted to the website. Logging and History allow you to specify what level of information is saved to the log file, and how long history (computer password read/reset events) is kept for before being purged. The Active Directory option allows you to specify how frequently Active Directory is scanned for structural (OU, not computer object) changes. The Host options are more core to OverLAPS function and require a service restart to take effect. You can use these settings to configure web access to OverLAPS (HTTP/HTTPS), and to tweak its performance. Congratulations! You now have an incredible simple yet powerful interface to the wonderful security benefits offered by Microsoft LAPS.